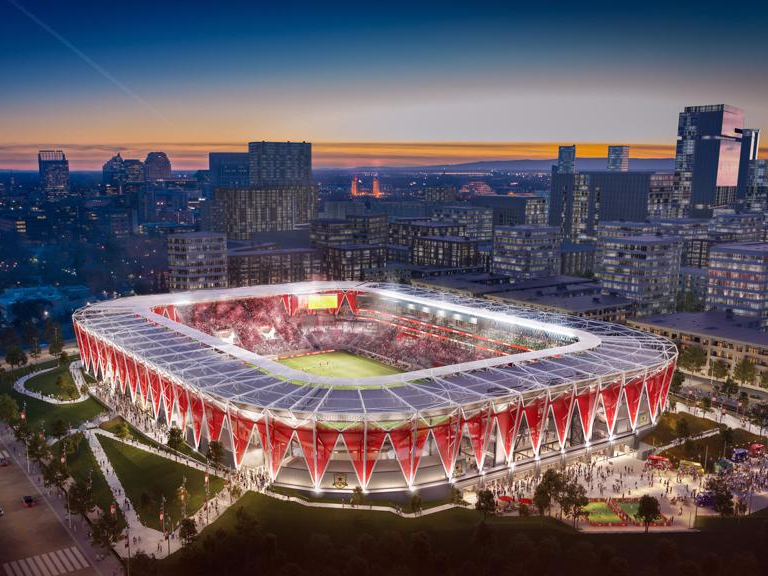 A rendering for the Sacramento Republic's proposed Major League Soccer stadium in the Downtown Railyards, released April 2, 2019. The Republic FC says it will build a $252 million soccer stadium at the downtown railyards and a 17-acre entertainment and shopping district — for a total private investment of $1 billion — if Major League Soccer picks Sacramento for its next franchise, and if City Council approves their plan next Tuesday. "For that $33 million, we get a billion dollars worth of investment," Steinberg said during a press conference inside an old paint shop at the railyards. Four members of the council — Angelique Ashby, Jeff Harris, Eric Guerra and Rick Jennings — were on hand to lend their support. According to a term sheet released by the city on Thursday, construction of the stadium would be paid for by the Republic and its new lead investor, Ron Burkle, who has agreed to purchase the team and front the costs if MLS gives Sacramento a pro franchise. Burkle, who also owns the Pittsburgh Penguins hockey team, issued a statement expressing optimism that Council would approve the deal and MLS would grant the city a team. “The owners and the Commissioner’s office have acknowledged that Sacramento is 100 percent ready. Everyone has worked hard, and we are ready," Burkle wrote. LDK Ventures, which developed the McClellan Park business community and has been instrumental in efforts to develop the railyards, will be involved in the project. MLS is scheduled to meet April 18 in Los Angeles to discuss who will receive the 28th franchise. The mayor says he plans to be there. The city of Sacramento revealed details for a Major League Soccer stadium deal with the Republic FC on Thursday. The term sheet, which outlines the framework for an approximately $33 million city contribution to the stadium, will be discussed by City Council next Tuesday. It's the latest development in a years-long effort by the city and the Republic to secure a professional MLS franchise, a journey that began in 2015. Sacramento is reportedly vying against St. Louis for a final MLS squad. The league has said it will expand to 28 teams, but 27 are already accounted for by expansion teams in Miami, Nashville, Tenn., and Austin, Texas. Part of the city and Republic’s plan to secure a team includes a road map to build a new stadium. The city is eyeing the downtown railyards; the Republic released new images and renderings of a possible stadium earlier this week. The estimated cost of the project is $252 million, according to the term sheet released Thursday. The city will contribute nearly $33 million through fee waivers and tax reimbursements instead of direct public funding. For instance, the Republic would pay up front for the construction of roads, sidewalks, sewers and a new light rail station around the stadium. To reimburse them, the city and the Republic would create a special financing district, which would allow the city to use the net increase in property taxes in the district to pay back the team for construction costs. This could amount to approximately $27 million. The city would also contribute up to $3 million for police and traffic control around the stadium during events, and would absorb administrative and permit costs up to an estimated $1.8 million. The city would also provide the Republic with the rights to five digital billboard signs, which project advertising near freeways and major commuter arteries and can generate significant revenue. Unlike the Golden 1 Center, the team would own the stadium, not the city. But the city would receive 10 “club tickets” and parking spots for all events at the stadium, similar to its deal with the Kings that secured a luxury suite for City Hall. In addition to the 14 acres land for the stadium, the team would acquire 17 acres at the railyards for an entertainment, retail and office development. The proposal also includes plans for a new team training facility and youth soccer academy. The Republic's bid to join MLS got a boost earlier this year when billionaire Ron Burkle, owner of the NHL's Pittsburgh Penguins, agreed to sign on as an investor. The team lost out on a bid to join MLS in 2017, with reports indicating the league wanted a larger lead investor. Sacramento Approves A New Soccer Stadium, But The Republic FC’s Journey Continues. Here’s A Look Back At The Team’s MLS Adventure. Sacramento Republic FC made its goal of joining Major League Soccer clear from the beginning. But so far, they’ve yet to secure a spot. Here’s a look back at the team’s efforts — and setbacks — since 2012. 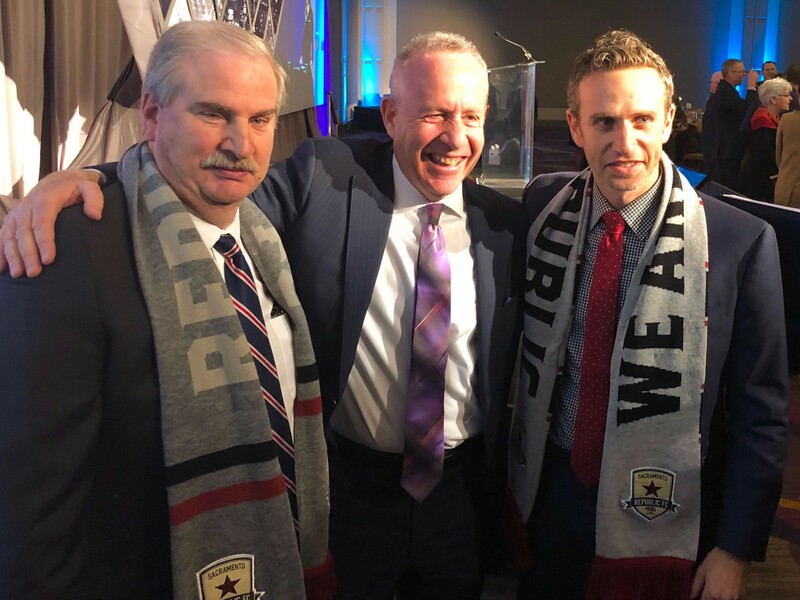 On Thursday, Mayor Darrell Steinberg and officials from Sacramento Republic FC announced a proposal to develop a new soccer stadium in the Railyards area.